Wednesday: seated uncomfortably on a small wooden chair, still damp from the thunderstorms, under a tent hastily erected on the Water Taxi Beach. The sun is out again after the deluge, but low in the sky, pink clouds threading through the skyscrapers as it sets. The sand crunches underneath and we eat toasted bread soaked in olive oil, watch Umbrian olive pickers work through their harvest. Saturday: asleep on the beach at Asbury Park, the shrieks of children and the pounding surf quieting my mind. Around me the sleeping bodies of my friends, lulled by the sun so bright overhead. The sour scent of pickles, leftover from our picnic lunch, drifts up, mingles with the smell of the ocean and sunscreen. Tuesday: legs curled up under me, threatening to tingle, on a blanket spread out in Central Park. People all around me, the hum of midsummer chatter almost drowning out the music from the Philharmonic ensconced in their shell in front of us. Fireworks end the evening; as I walk out of the park, a mournful bagpiper plays for a crowd of guests silenced by the explosions. Wednesday: cheering with strangers, eyes red from their flight, on a leather banquette as our team makes it through to the finals. Iced tea, brewed too heavily, makes my teeth chatter and my palms sweat, but on second thought it could just be the game. Yesterday morning: standing at the kitchen counter, dicing rhubarb and mincing grapefruit peel. The fruit macerates in sugar and juice all day. At night, jars and labels are washed, sterilized in the oven. The jam comes to boil, foam is tediously skimmed. The mixture thickens, grows glossy then dull, pockmarked by bubbles. A mind long distracted finds focus. Jars are filled, sealed tightly; gentle pops come from the kitchen. Rhubarb is everywhere these days. We've eaten a glut of it, stewed with tiny, fragrant strawberries into yielding submission, sometimes with yogurt, sometimes without. But, tiring of tradition, I've been meaning to do something else with it lately. This recipe, which combines tiny bits of grapefruit peel and juice with diced rhubarb, is like a citrus marmalade, but gentler and softer somehow. The rhubarb tames the grapefruit, surprisingly; pillows out the bitter edge. 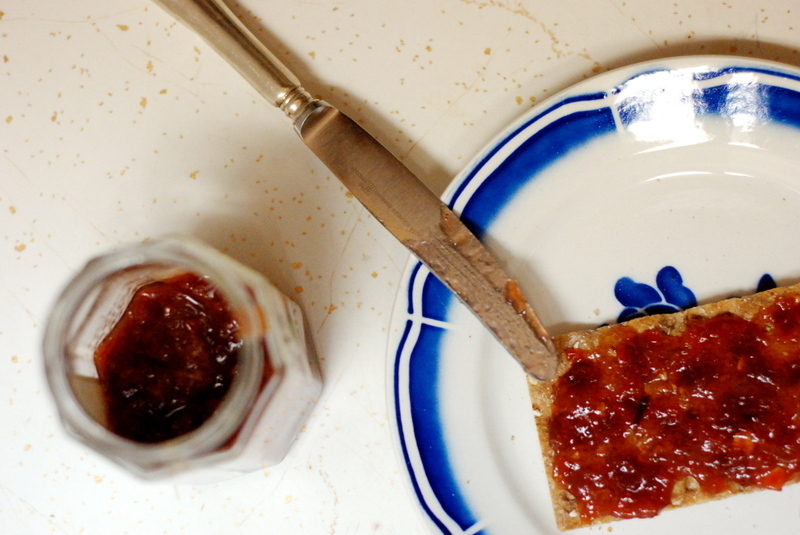 The preserves have a languid set, perfect for toast eaten on humid morning, just before it gets too hot. I love the color, somewhere between pink and red, and the way it moves under the knife. Note: If you'd like a somewhat more rhubarby jam, use the peel of only one grapefruit. Still juice both of the fruits, though. 1. Wash and dry the rhubarb and cut it into 1/2-inch dice. Peel the zest off the grapefruit and chop it very fine. Put the rhubarb, chopped zest, and sugar in a large heavy-bottomed stainless steel pot. Juice the grapefruits into the pot. Let the mixture stand for 30 minutes (or overnight) to allow the sugar to dissolve and the rhubarb to release its juice. 2. Prepare five 8-ounce canning jars and self-sealing lids in boiling water, following the manufacturer’s instructions. Put a small plate in the freezer to be used later to test the consistency of the jam. Bring the pot of fruit to a boil over high heat, stirring occasionally to make sure it is not sticking to the bottom. The mixture will bubble high up the sides of the pot. Skim off any light-colored foam collecting on the edges. Soon the jam will subside, still bubbling thickly. 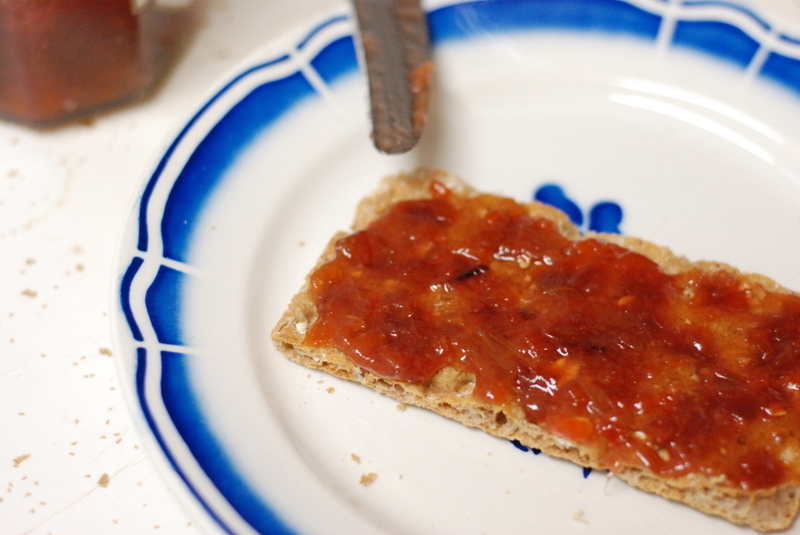 Stir frequently and start testing for consistency by putting small spoonful of jam on the cold plate. This cools the samples quickly so you can tell what the finished texture will be. 3. When the jam has cooked to the thickness you want, turn off the heat and carefully ladle the jam into the prepared canning jars, allowing at least 1/4 inch of headroom. Seal with the lids according to the manufacturer’s instructions. The preserves will keep for 1 year.